These days it seems like almost everyone has a fantasy sports team. If you’re one of the thousands of Americans that gets their fantasy fix through the services provided by Yahoo.com, you can now monitor your fantasy teams right from your iPhone with Y! Fan—Professional Edition from ES Group Mobile. Fantasy on the Phone: The Professional Edition of Y! Fan lets you chart the progress of your fantasy team. But you can also make player moves right from your iPhone or iPod touch. Y! Fan puts your fantasy team to your fingertips, making it much easier to keep up with the highs and lows of your fantasy fortunes. 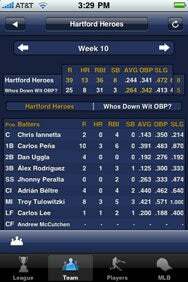 The app displays all your team and league information in a convenient, easy-to-read interface. You can check your roster, current stats, standings and recent transactions all with a swipe of your finger. Besides the $4 Professional Edition, ES Group Mobile also offers a free edition of Y! Fan. The free version lets you check current scores and stats, but you can’t make changes to your roster or lineup; that’s a feature of premium edition. Both paid and free versions of Y! Fan support Yahoo’s free and premium fantasy baseball, football, basketball and hockey leagues. The Professional version of Y! Fan lets you adjust your lineup, add or drop players, and propose trades with ease. You can also write on your league’s message board or view the league Web site in the app’s built-in Web browser. Y! Fan even retains Yahoo’s player notes function, a welcome feature for any manager looking to monitor breaking news about his team. On Yahoo’s fantasy sports site, player notes appear as yellow sticky notes which expand when you click on them. Y! Fan replicates this feature with a player notes screen that displays the latest news on your players with the most recent news at the top of a list. Modifying your roster in Y! Fan is also easy. If you want to add a new player to your roster, you can scroll through the list of top-ranked free agents by swiping your finger down the screen in the same way that you swipe in other iPhone applications. If you want to change your lineup, you simply tap a player’s current position and choose a new position from the scroll wheel which appears. While changing a daily lineup is easy, doing so for a weekly lineup is slightly more difficult. In most weekly fantasy baseball leagues, your lineup locks on Monday morning, meaning you must set your lineup on Sunday. When adjusting your lineup in Y! Fan, you have to go to the next Sunday—or roster deadline day—manually. It would be easier if Y! Fan allowed you to set the type of league (weekly or daily) and automatically take you to the next roster deadline day based on those settings. If you’re like thousands of other fantasy fanatics, you probably have more than one fantasy team. Y! Fan Professional supports an unlimited number of teams in each of the aforementioned Yahoo games. The Y! Fan free edition limits you to just one team per sport. Y! Fan lets fantasy owners do almost everything on the go: adding and dropping players, making lineup adjustments and reading the latest player news. Y! Fan also includes a section for the latest fantasy news, entire columns devoted to recent transactions and tips on which players to claim off the waiver wire. Currently Y! Fan features CBS Sportsline columns but it would be nice if you could also read Yahoo, ESPN and columns from other Web sites, too. With all these features and capabilities Y! Fan is a fantasy sports owner’s dream come true. Both versions of Y! Fan are compatible with any iPhone or iPod touch running the iPhone 2.x software update.